Are There Ghosts in the Museum? The Archives' "Obituary Room" lies apart from the main archives area, where visitors stop by with questions, chat with the Archives helpers, and quietly peruse items on the big public conference table. Ducking under the low brick arch, so low it regularly whacks one 6'5" former wrestler and Archives helper, the explorer of the Obituary Room enters a silent chamber. One obituary file silently slides open to reveal hundreds of index cards. Historians from decades past have helped amass these tiny records of former Ypsilantians. "You'll learn, as you look at these cards, who made mistakes and who cut corners," advised Archives helper J., as I began adding new obituary cards today. Some cards show spidery pencil handwriting. Others have yellowed newspaper clippings glued on. Others have ambiguous old handwriting leaving the visitor wondering, "is that a W...or a D...?" Absorbed in delving through the thousands of tiny cards, the visitor senses that the room gets even quieter than silence. The light looks oddly harsh. The opened drawer of cards suddenly seems like a crowd at a party, with each card with something to say. The temperature drops. In the corner of your eye--er, what was that? Three paranormal groups have investigated the Museum and Archives. 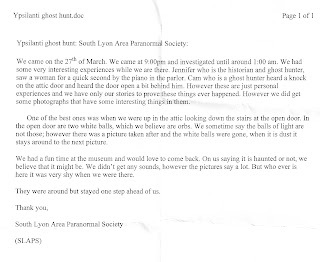 Here is a recent report from the South Lyon Paranormal Society. Transcript below (click on image for larger version). "We came on the 27th of March. We came at 9 p.m. and investigated until around 1 a.m. We had some very interesting experiences while we are there. Jennifer who is the historian and ghost hunter, saw a woman for a quick second by the piano in the parlor. Cam who is a ghost hunter heard a knock on the attic door and heard the door open a bit behind him. However, these are just personal experiences and we have only our stories to prove these things ever happened. However we did get some photographs with some interesting things in them. "One of the best ones was when we were up in the attic looking down the stairs at the open door. In the open door are two white balls, which we believe are orbs. We sometime say the balls of light are not those; however there was a picture taken after the white balls were gone, when it is dust it stays around to the next picture. "We had a fun time at the museum and would love to come back. On us saying it is haunted or not, we believe that it might be. We didn't get any sounds, however hte pictures say a lot. But who ever is here was very shy when we were there. "They were around but stayed one step ahead of us. Mystery Photo: Can You Help Identify? Deep within the highly organized and accessible Archives are a few back-room boxes of forgotten history. Several boxes of unlabeled photos featuring beloved aunts, cherished sisters, and memorable outings are shelved in a back storage room. With each passing day, the chance of identifying these photos grows incrementally smaller. These photos, and the stories of the Ypsilanti lives they depict, are falling through the sieve of collective memory into obscurity. Can you help save this photo from that fate? You can see the original scanned, faded version and a version I sharpened a bit. 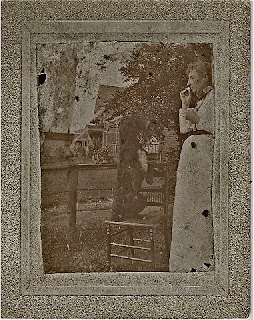 The photo depicts a woman holding up a dog treat for her eager dog. 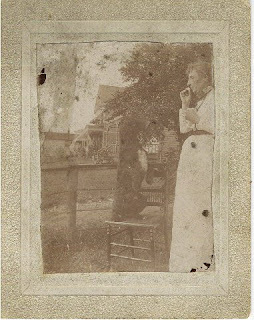 The photo has no label, number, name, or any other identifying inscription on the back. But we are not without resources. The photo shows many clues that could help us pin it down. 1. The photo shows what appear to be the fronts of 2 neighboring houses. The closer house has a distinctive porch lattice. 2. The woman's dress likely dates from a particular time period. Is there a kind reader who is knowlegable about the history of fashion? 3. 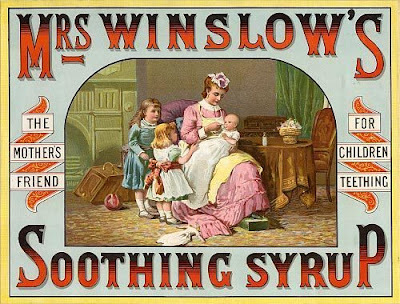 Similarly, from what period is the rather ornate wooden chair? 4. The woman is wearing a necklace. Is it a rosary? Does the necklace signify she was rather well-off, or was it more common in her time period for women to wear somewhat large-ish necklaces in general? 5. The structure at the left middle distance has a roof with two distinctive chimneys. What is this structure? What other clues am I missing? Do you have some ideas to contribute in "comments"? In just a few inches, these two photos span more than a century. Kind readers will recognize this image as an eastward view of Cross Street, taken just east of Huron. It encompasses the old City Hall on the left, Cross Street Bridge, and a sliver of Riverside Park. Between the 1907 photo and the 2009 photo, how many differences can you spot? There are also a couple of structures that Dusty D does not recognize, to my chagrin--but perhaps a reader will! You can click on each photo for a larger image. 1. The 2009 photo features some 250-horsepower vehicles; the old photo features a 1-horsepower vehicle. 2. The old photo has what appears to be manually-operated railroad traffic barriers in the distance. Where did the operator stay? 3. The new photo features an addition on the east side of the old City Hall at left. 4. 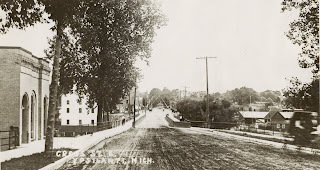 The old photo shows a much narrower Cross Street Bridge. 5. The old photo shows a large white building opposite the river from the old City Hall. Dusty D hastens to inform readers that I once knew what this was, but have unfortunately forgotten. On the water as it is, would it be a mill? 6. The old photo displays a complex of buildings in what is now Riverside Park. What are these buildings? 7. The old photo features telegraph (?) or electrical poles; which one? 8. The new photo shows streetlights...it must have been very dark going home in 1907. How many other differences can you spot? Feel free to add your observations and speculations in "comments." If the Ypsilanti Museum is "the city's attic," what is the Museum's own attic? "I was going up here the other day," Archives helper J. told me as we rested, winded, on the third floor before ascending to the attic. "I got up there, and I could have sworn I heard something. I said, 'Hello?'" And I swear, clear as day, I heard a voice from the corner say, "Hello." J. related this story just as my foot had touched the first step of the stairway leading up to the attic. My foot froze on the stair. Just the previous week a team of ghosthunters had combed the Museum with electronica and flashlights. They'd got a recording that two Archives helpers verified they'd later heard on tape--the voice of a man saying "Help me." Yes, the one group did record something that sounds like a male voice saying "Help me." We do not know who it could be, but a Robert Burns died in the house, January 12, 1921. the most activity occurred when his name was used. I did feel two cold spots during the investigation, one in the second floor dress room, and the other at the table in the archives room. Whatever it was seemed to feel more comfortable near me than with the others. The presence seemed more male than female. We may have more than one ghost in the house. When two of the investigators walked through the kitchen their k-2 device lit up. They asked if the ghost wanted to talk to them, once for no and twice for yes. The device lit up once. So they left. I had to stop in at the archives the next day, or I might never have been able to enter the building again. 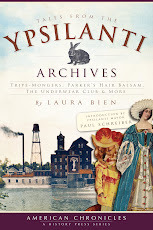 Just as the Smithsonian Museum is "the nation's attic," the Ypsilanti City Archives are "the city's basement." In contrast to the ornate splendor of the Museum building, the entrance to the Archives in the Museum basement is a modest lean-to on the Museum's north side. The door is so unassuming that I missed it entirely when I first arrived at the Museum as a new archives volunteer. The sidewalk curving around the Museum's facade leading to the Archives' door is curvy, like the Huron River behind the Museum. If a canoeist there put his boat in the river, the sinuous narrow waterway would soon open up into the comparative vastness of Ford Lake. The little curvy walkway also leads the explorer to a world astonishing--rich and wide and deep: the diaries, photographs, personal letters, location files, tax rolls, crime histories, obituaries, and artifacts comprising a city's collective memory.